The loan agreement is governed by the applicable laws of the state of Utah. The Fee For Our Loans is $30.00 Per $100.00 Borrowed. The Annual Percentage Rate (A.P.R.) for our loans ranges from 365.00% to 1564.28%, depending on the term of your loan. Please refer to the table below to find your A.P.R. 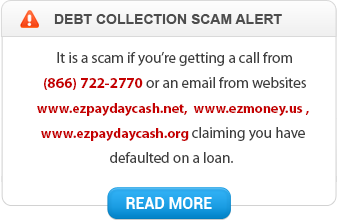 EZPAYDAYCASH.com provides short-term cash advances which is due on your next pay date, unless your next payday is less than 7 days away. In this case, we will debit your account on the following pay date after. The maximum term for our loans is 30 days. If we do not hear from you prior to your loan due date, we will automatically debit the full loan balance from your account. If you do not want us to withdraw the full amount, you have the option to extend your loan until your next payday. You are allowed up to two (2) extensions or rollovers with only minimum payment before we require you to pay down your principal. The maximum rollover period is 10 weeks or 70 days. You may obtain an extension by paying at least enough to cover interest earned up to that point (usually the finance charge previously disclosed of $30 per $100 borrowed and APR (Annual Percentage Rate) ranges from 365% to 1,564%, depending on the terms of the extension ) We also recommend that you pay as much extra as you can to reduce the principal balance. The extension amount will be withdrawn from your account on your due date. We must receive your extension request before 8:00 PM EST the day before your loan is due.